The Los Lunas stone (located a few kilometers from the small city of Los Lunas, New Mexico) stands as a witness of what many scholars regard as the first „star map“and „religious testimonial“ connecting the Old World with the New World. According to the late Dr. Cyrus Gordon, professor of Brandeis University and Harvard University, the stone authentically depicts a date equivalent of September 15, 107 BCE in a version of paleo-Canaanite or „old“ Hebrew script. The orthography and aesthetic balance of the letters suggest the work of „unknown“ scholars acquainted with the traditional Ten Commandments recognized in the pre-New Testament period by special people who had a reason to „stake out“ this area in relation to the Holy Land, or who had been so inspired to leave behind a witness of Israel in the New World. Other linguistic scholars like Dr. James Harris (formally of BYU) are of the opinion that the stone is connected with the work of Israeli craftsmen who were able to reach the New Mexico area as early as 400 BCE, being part of the great diaspora that relocated the legendary „Ten Lost Tribes of Israel“ to various parts of the world. This occurred from the time of the destruction of the First Temple to the beginning of the intertestamental period. 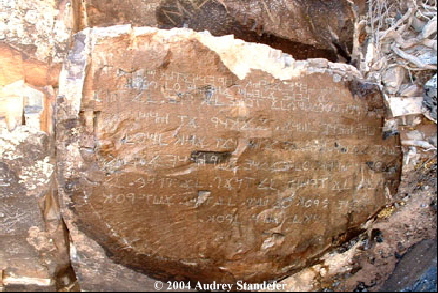 Still others who are cultural historians acknowledge that Phoenician navigators and linguistics may have had a strong influence on the creators of the inscription. The Phoenicians were the scholarly source of both the ancient Hebrew and Greek orthography and the „fathers of phonetics“ used for the updating of many important languages that were later spread to developing centers of commerce through their superb navigational system. Most anthropologists feel that the stone shows the Ten Commandments in paleo-Canaanite or „old“ Hebrew script and is the work of rabbinic scholars or cartographers who were taught by rabbinic authorities who had to leave Portugal or Spain in the 16th century. It would not be uncommon to mark the „edge“ of the New World Empire with ancestral words of God’s Providence and power since the New World was divided between Spain and Portugal. The commandments in this context stand as a type of „mezzuzah“ on one of the mount gates for the official ground or territory of the new empire was „staked“ for all to acknowledge. In fact, the first governor’s home built in North America was nearby at Sante Fe. Finally, in spite of the strikingly good condition of the ancient script, it should be noted that this location is exactly within one of the important sacred areas mentioned in The Book of Knowledge: The Keys of Enoch (Key 105). It is clear that the ancient sacred areas now being found form some sort of witness in the mountains and desert (Key 215) or, to use the language of David, at „the ends of the earth“ –that mark the sacred places for the gathering of the lost tribes of Israel (spiritual humanity) — in a time of planetary change and Messianic visitation. Let us be prepared for understanding how God’s Names were scattered throughout the world as a witness of a higher cosmology accepted by diverse cultures who also claimed a higher parentage.